Since 2002, two individuals who admitted to having renounced for tax avoidance purposes were found to be inadmissible under section 212(a)(10)(E) of the Act. Five additional individuals were identified as possibly inadmissible on the basis of section 212(a)(10)(E). One was served a notice to appear, but was not placed in removal proceedings. The four others were paroled, one of whom was deferred for inspection and later admitted. Many countries, including Australia, Denmark, India, the Philippines, and the United Kingdom grant their former citizens “diaspora visas” or allow them to re-acquire citizenship easily — a simple humanitarian gesture so that emigrants can make decisions about their nationality without worrying they will be blocked from coming back to visit their hometowns, attend their high school reunions, watch their nieces & nephews grow up, or care for their parents in their dying days. In contrast, the U.S. threatens its diaspora with permanent banishment: § 212(a)(10)(E) of the Immigration and Nationality Act, known for short as the Reed Amendment, makes former citizens inadmissible if DHS (originally, the Attorney-General) determines that they “renounced United States citizenship for the purpose of avoiding taxation by the United States”. Some Canadians have stated openly that fear of the Reed Amendment is their sole reason for retaining U.S. citizenship. Despite the legal, operational, and policy challenges to the full implementation of section 212(a)(10)(E) of the Immigration and Nationality Act, the Department of Homeland Security and the Department of State remain committed to continuing to strengthen lines of communication, improve information sharing, and develop more consistent protocols to ensure that both Departments are aware when a renunciant admits that he or she renounced U.S. citizenship for the purpose of U.S. tax avoidance. So there you have it, straight from the horse’s mouth: they have no way to enforce the Reed Amendment unless you “admit” to a government official the obvious truth that taxation-based citizenship is making it miserable for you to lead a normal life in the country you have chosen to call home. When & where did the two exiles admit their motivations? Under section 212(a)(10)(E) of the Immigration and Nationality Act, the Department of Homeland Security has the authority to deny admission to former U.S. citizens that are deemed to have expatriated for purposes of tax avoidance. In over a decade, the Department has not issued regulations nor has it undertaken any significant steps to enforce this provision. The Committee directs the Secretary to report within 90 days on the steps the Department is undertaking to enforce this law, including a schedule for issuing guidance or regulations, if necessary. The wording of the statute is embarrassing. How can an alien renounce U.S. citizenship? In what capacity would said alien do so officially? One assumes that a court of law would find the language incoherent and unenforceable. Still, the intention is clear and needs to be addressed. This is the way we legislate at 5 o’clock in the morning 4 days before adjournment. One wonders how many other similar items ended up in the continuing resolution passed by the Senate less than 6 hours before the end of the fiscal year. The provision imposes an extraordinary penalty on certain persons who exercise the legal prerogative of expatriation: permanent exile from the United States … we have enacted a measure that does not reflect well on a free society. I should also note that 8 USC 1182 has been enforced on a very few (not widely reported) occasions even tho there are still no [regulations] for it as far as I know. In fact I have been called on a couple of these cases. Problem is that IRS does not have authority to share the tax info with CBP so CBP officers don’t usually have a leg to stand on. Doesn’t necessarily stop them from trying and they can easily shift to the immigrant intent ground in substitution as they seem to have done in the Ver case. In the anecdotal cases I have seen, the person usually got in eventually because they were not high profile and could get a waiver if necessary. Interestingly, in a December 2013 interview with Ms. La Torre Jeker, former IRS Office of Chief Counsel (International) lawyer Willard Yates revealed that the IRS and the Customs Service (the predecessor of CBP) tried to draft regulations to work around the lack of authority for tax information sharing in the early 2000s; they proposed to check the names of arriving tourists against the Federal Register list and require those with matching names to waive their tax information privacy rights so the Attorney-General could make the determination of tax avoidance motives. However, this turned out to be impractical and was never implemented. That was the only time that the IRS has proposed using the expat honour roll for any substantive purpose. Later on, after FATCA was passed, the IRS could have required that banks check the expat honour roll if a person with U.S. indicia claims to have given up citizenship, but even with all the other garbage they’re demanding of banks and individuals, the IRS did not require this — presumably because they’re just as aware as the rest of us that the published expatriates list is total garbage. The Department of State reports that 1,335 individuals renounced U.S. citizenship in the first quarter of Fiscal Year 2015; 3,415 persons renounced in Fiscal Year 2014; 2,999 renounced in Fiscal Year 2013; and 932 renounced in Fiscal Year 2012. However, not all individuals who appear in the Federal Register list are renunciants. For that matter, not all people who renounce citizenship show up in the Federal Register list, as can be verified through a cursory glance at statistics in NICS, which excludes non-renunciant relinquishers. NICS excludes non-renunciant relinquishers because the relevant law (18 USC § 922(d)(7)) uses the word “renounced”; the Bureau of Alcohol, Tobacco, and Firearms’ response to comments (62 FR 34634, 34638) on their original Notice of Proposed Rulemaking explains that they interpret that word to include only people who gave up citizenship under 8 USC § 1481(a)(5) or (6), not any of the preceding four paragraphs of that subsection. It’s a mystery why DHS implicitly disagree with the FBI about the meaning of the word “renounced”. Maybe they’re simply ignorant of the law on loss of nationality. Well, it’s a complex area of law, and even judges get it wrong — see e.g. Gefen by Gefen v. Upjohn Co., 893 F. Supp. 471, 474 (E.D. Pa. 1995), an otherwise unremarkable “no diversity jurisdiction for Americans abroad” case, except that some district judge thought that the law controlling loss of citizenship was that in effect at the time of the person’s birth rather than the time of the purported loss. Alternatively, it’s possible DHS don’t really care enough about Reed’s crusade to do much fact-checking for their report to him, which seems like a perfectly reasonable attitude. Some Congressmembers or bureaucrats have apparently proposed that DHS could enforce the Reed Amendment by presuming that people with certain characteristics were tax avoiders and then placing the burden of proof on those individuals to waive their right to privacy in order to refute the charge — after all, Treasury officials have already said that living abroad and committing ordinary personal finance is suspicious, and that the IRS Criminal Investigation Division is looking closely at people who give up U.S. citizenship. Although the U.S. internal revenue code, at 26 U.S.C. §§ 877, 877A, currently applies an “expatriate tax” to renunciants who trigger objective standards based on average annual net income tax, net worth, and past tax compliance, it would be difficult to rely on the imposition of such a tax as the basis for determining that a person who is subject to such a tax subjectively renounced citizenship for tax avoidance purposes, as section 212(a)(10)(E) requires, particularly if an individual in fact complied in paying any liability resulting from the expatriate tax provisions. In particular, DHS and DOS have determined that it is not advisable to implement section 212(a)(10)(E) through a rebuttable presumption that persons renounced citizenship for U.S. tax avoidance purposes where, for example, they failed to pay the expatriate tax (if it could be determined that an individual is subject to it), they acquired a tax windfall shortly after expatriation, or there is evidence of acquiring residence in countries that may be considered tax havens. Among other inadequacies, any such presumption likely would be either highly under-inclusive of persons who in fact renounce citizenship for tax avoidance purposes, over-inclusive in capturing persons who did not in actuality renounce citizenship for tax avoidance purposes yet meet the requirements for the presumption, or both. Moreover, even if a renunciant were to waive Treasury confidentiality provisions, such that DHS and DOS might review specifics of an individual’s Internal Revenue Service filings, DHS lacks the expertise and resources to review tax filings meaningfully or engage in complicated tax liability analysis, involving both domestic and foreign tax law to determine whether a section 212(a)(10)(E) inadmissibility presumption could be rebutted. Note DHS’ tacit admission: the tax law is so complex that even government officials don’t understand it, and they also know that those who have renounced U.S. citizenship have also been subject all along to “foreign” tax in the countries where they have been residing. Of course, that doesn’t stop Treasury from demanding that the diaspora spend hundreds of hours filling out their “offshore” asset reporting forms every year for the “privilege” of not being fined obscene amounts. The prudent former citizen would be careful about making any inflammatory comments about the U.S. tax system or taxes in general, whether at the consulate or at the border. It is within the authority of the inspecting Customs and Border Protection officer at the border to make a finding of inadmissibility on any of the grounds contained in INA §212. During the inspection process, a person’s place of birth or prior U.S. citizenship may give rise to questions about nationality, because a U.S. citizen is required by statute to claim U.S. nationality and present a U.S. passport. Someone who has renounced citizenship need only present a copy of the Certificate of Loss of Nationality to confirm that he/she is no longer a U.S. citizen. No explanation or reason is required or recommended. Despite its disuse, the Reed Amendment is still a valid law and therefore has the potential for use and misuse, even in the absence of the formal determination contemplated by its terms. For obvious reasons, the inspection booth during entry to the U.S. is neither the time nor the place to make political statements or constructive criticisms of the U.S. tax system. However, it’s not clear exactly how DHS learned that the two ex-citizens to whom they denied entry “admitted” that they had tax motivations for renouncing U.S. citizenship, or what that “admission” actually was. Did they make their statements at their renunciation interviews? Did they get into an argument with a border guard? Did they speak out in the media, as Terry Gilliam did? TG: I thought I’d just simplify my life. I’m getting old. I’m gonna die. I’m not at all happy with what America has been in the last 10 years. [Laughs.] The reality is, when I kick the bucket, American tax authorities assess everything I own in the world—everything I own is outside of America—and then tax me on it, and that would mean my wife would probably have to sell our house to pay the taxes. I didn’t think that was fair on my wife and children. AVC: Isn’t it a little early to be thinking about dying? We don’t have any information about the two who were found inadmissible, but we have a clear example of someone who did speak out about the tax situation in much stronger terms in the media, and who apparently was not determined to be inadmissible due to the Reed Amendment. Last January, when it was first reported that Bitcoin & explosives entrepreneur and Saint Kitts and Nevis citizen-by-investment Roger Ver had been denied a U.S. visitor visa to speak at a Bitcoin conference in Florida, some Homelander “media professionals” worked themselves up into glee in response to his troubles and the implicit threat they represented to the rest of us ex-citizens who had refused to roll over and play dead for FBAR, FATCA, PFIC, and all the other garbage that the Financial “Crimes” Enforcement Network and “Internal” Revenue Service were throwing at us, and assumed Ver’s visa denial marked official Reed Amendment enforcement. 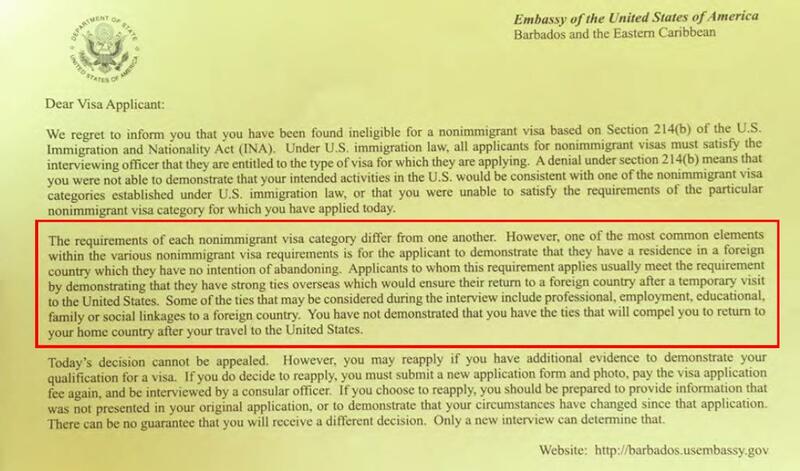 The U.S. Embassy in Barbados wrote that Ver’s visa was denied on grounds of failure to overcome presumption of immigrant intent, making him one of 1.7 million people who failed to get a U.S. non-immigrant visa for similar reasons that year; that is to say, he was not one of the two who were officially denied entry to the U.S. due to the Reed Amendment. Ver himself says he was able to obtain a visitor visa in 2015 (judging by these tweets, sometime in August or September), though by then he had missed his original speaking engagement. There are other well-documented cases of ex-citizens visiting the U.S. without issues. Petros went to Alaska due to a family emergency in 2013. Hong Kong actor Donnie Yen, the star of the recent Ip Man 3, spent Christmas 2014 in Los Angeles with his wife and children. The first reported case of denial of entry was at the Vancouver, B.C. International Airport by the USCBP. The refusal to allow entry was based on the person having renounced his U.S. citizenship for tax reasons. Because the renunciation was made before Section 212(a)(10)(E) was enacted in 1996, the USCBP reversed its position after being presented a legal brief by the person’s attorney. It’s not clear if DHS counted this as one of their two cases of official Reed Amendment enforcement. So, DHS is trying to say: the Reed Amendment is no danger to you, as long as you observe the rule of “don’t ask, don’t tell” at the consulate and the border. The implied threat of the IRS — “keep paying your accountant to fill out all your forms and prove you owe no tax, or you’ll never see your bedridden grandma again” — is probably a hollow one, absent Congressional action. You can go ahead and waltz your way through the humiliating charade of renunciation. You’ll only be under the same threat of arbitrary visa denial as any other foreigner. The American Way: keeping your mouth shut and handing over thousands of dollars in order to exercise your human right to choose your nationality. Well isn’t this a nice post! I missed it while I was on vacation. Great work by Eric as usual. Unbelievably stupid US government implementation of the “law”, the Reed Amendment. This post proves my contention that it is a bill of attainder, as it is not a court deciding who gets punished but some pin-headed bureaucrat (or is the term “bureaucrat” saying to much for the dunderheads in the DHS?). It’s relatively short, and I’d really love to meet the author. He was able to nicely say “Hey guys. There’s really no way for us to uphold this law. So we’re not going to do anything…k?.” … It’s like the government is agreeing to share all their best ghost stories with each other.